Meetings, Birthdays, business outings, family get togethers or any special occasion, we can accomodate you and your group. Great meeting room and banquet hall on Madison's West Side. 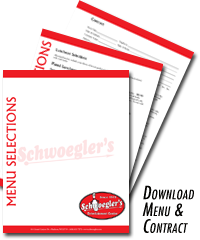 The Schwoegler’s Banquet Center comfortably seats up to 150 guests and features reasonably priced food and beverages.Give our experienced and helpful staff a call for your next special occasion or company function. "Please pass on the message to Schwoegler's that the members of the Madison Sports Hall of Fame Club have been extremely happy that we moved our weekly lunches to Schwoegler's! The food has been fantastic, the options have been great, and the portions have been perfect. The banquet room fits us just right and the staff has gone out of their way to make us feel welcome every time we see them. A huge two thumbs up for Schwoegler's Park Towne Lanes!! We couldn't be happier!!"